These pipe tongs are made from sturdy steel to handle pipe, round bars and cast pipe. Steel curved gripping arms function just like they should. Optional replaceable polyurethane pads available to protect smooth or polished surfaces (not reflected in price or dimensions below). Load must be balanced and controlled when lifting. 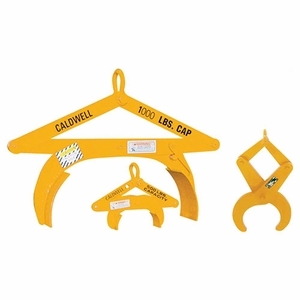 Use in pairs with a Lifting Beam or Spreader Beam for added stability. Available in fixed diameter or adjustable versions (see below). Complies with ASME standards.